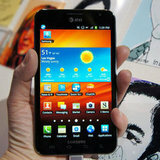 The biggest smartphone (or tiniest tablet?) we've ever seen, the Samsung Galaxy Note has finally received a price and release date: it's headed to AT&T on Feb. 19 for $300. Whether you're looking for a powerful smartphone or portable tablet, the Galaxy Note has you covered. Coming with a 5.3-inch HD Super AMOLED screen, 1.4GHz dual-core processor, HSPA＋ and LTE connectivity for fast upload and download speeds, an included stylus (called the S Pen), and dual cameras (8MP rear facing and 2MP forward facing), it's got everything you might need from either device. The Galaxy Note could also be your BFF when it comes to organizing your life. Included software integrates with your calendars, to-do lists, and schedule, and the S Memo app allows you to use the stylus to write notes and draw pictures, then converts them into a memo for later use. You can preorder the Galaxy Note starting on Feb. 5 in two colors - carbon blue and ceramic white.